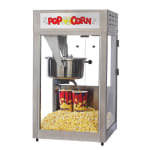 The Gold Medal 2600 Super Pop Maxx popcorn machine pops 16 ounces of corn in a batch. To keep the popcorn at its peak freshness, the heated deck keeps popcorn fresh by circulating warm air around it. The glass lifts out to make cleaning it easy. To reach the maximum capacity of popping but have a low energy consumption, an efficient heating element is combined with an all-in-one kettle. The stainless steel dome resists the effects of corrosion and makes cleaning easy. The Gold Medal 2600 Super Pop Maxx popcorn machine has a large filter and an exhaust fan to spread the enticing scent of the popular snack to potential customers. "used at many college events no problems well one minor one switch fell apart looking into new one ." "We had a Gold Medal 8 oz. popper, and our volunteers were spending 3 hours popping corn for our elementary classrooms and movie nights. We purch..."
Pops almost too fast to bag! "We had a Gold Medal 8 oz. popper, and our volunteers were spending 3 hours popping corn for our elementary classrooms and movie nights. We purchased this GM 2600 16-oz popper, and now the volunteers have to work hard bagging to keep up with the popping! They're very happy with how well it works. It heats up quickly, too."